At first, it seemed like a small story. The royal editor of the News of the World was caught listening to the voicemail messages of staff at Buckingham Palace. In 2007 he and a private investigator were sentenced to prison and the case was closed. But award-winning journalist Nick Davies felt sure there was more to it and began his painstaking investigation which ultimately exposed a world of crime and cover-up, of fear and favour – reaching all the way to the top. This book is the definitive, inside story of one of the major scandals of our age. 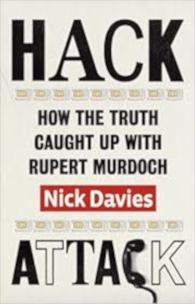 It tells for the first time how Davies and a network of rebel lawyers, MPs and celebrities worked tirelessly to uncover the truth about phone hacking: how they challenged Rupert Murdoch, one of the most powerful men in the world; how News International attempted to protect itself with lies and threats and money; how the police and the press regulator failed to find the truth. Drawing on exclusive interviews with private investigators , journalists, politicians, police officers and Murdoch executives, Hack Attack blows the lid off the world of Fleet Street, Scotland Yard and Downing Street. It discloses in detail the bullying and law-breaking in the newsroom of the News of the World, and reconstructs the history of failure and official secrecy inside police ranks. Above all, this book is a study of the power elite. It paints an intimate portrait of the social network which gave Murdoch privileged access to government, and allowed him and his people to intimidate anyone who stood up to them. Hack Attack is a nail-biting account of an investigative journalist’s journey, and is a shining example or the might of good journalism. It tells the story of what happened when truth caught up with power. First published by Chatto (Penguin Random House, UK) in 2014. George Clooney will direct a film based on the book. Read more here.